Each of these six price sequences are taken from charts within the YTC Price Action Trader, where I’ve presented my theory of the markets, my method of analysis and my trading strategy. The strategy I’ve provided in the ebook series is simple in concept – fade weakness when price interacts with S/R, and fade weakness in a pullback within a trend. The reality though is that it’s hard to trade in the uncertainty of market price action. It’s the infinite variations of the patterns that will have you doubting and second guessing your analysis. 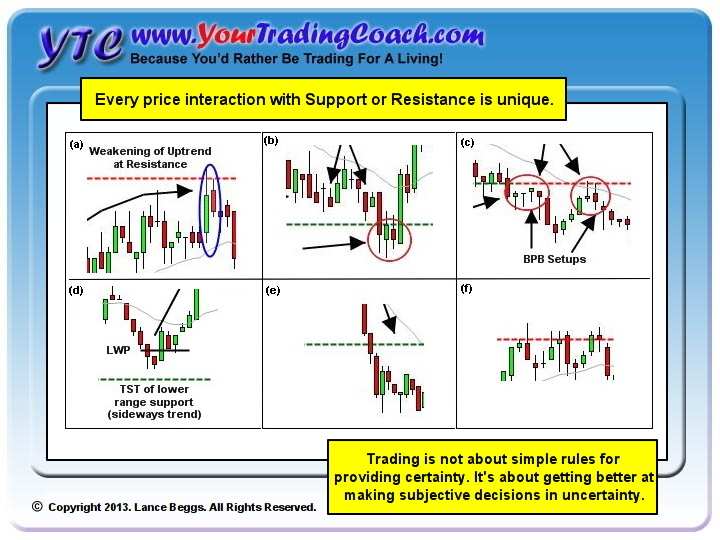 Let’s consider some variations we see in the above image, as price approaches an S/R level.Every example provided in this image is unique, just as every occurrence in the markets is unique. As price approaches an area of S/R, should you take an entry as it tests the level? Or should you hold out for a break of the level and a possible breakout failure? As price slowed into the area of resistance in example (a), there was a potential test opportunity at the doji (mid-chart). Of course, this trade was stopped out as price continued to push just a little further to create a breakout failure setup. If you took the first, and were stopped out by the choppy price action, will you now have the confidence to take the second? Example (b) produced similar price action – a weakening test of S/R which then stopped us out, broke S/R and then moved again in our original direction. While a similar scenario to (a), the questions it raises are very different. In this occurrence, price held below the support level for almost 10 minutes. Is this enough to show acceptance of price below the support zone? Should you be holding for a breakout pullback, rather than taking any breakout failure entry? Will you trust the breakout failure trigger, or delay slightly and miss the rapid move higher? Example (c) shows another variation. The nice tails below the post-breakout price action would have you jumping at the chance to take a breakout failure entry. But somehow there was never enough demand to drive price higher. Would you have had the ability to perceive the failure, and the courage to reverse into the first breakout pullback setup? If you did, and then saw it scratched at breakeven when price returned to the S/R level again, would you have had the confidence to take the second entry? Or would the recent loss and scratching have you a bit hesitant to re-enter? Sometimes the market never quite reaches the level as shown in (d). Sometimes it smashes straight through it, as in example (e). Other times, as in (f), price just holds at the level and grinds sideways, allowing neither bulls nor bears the opportunity for profit. Every situation in the markets is unique. That’s what makes it so hard to trade. Your ability to trust yourself and your strategy, with sufficient confidence to allow you to take the entry and exit signals without hesitation. All three of the above are a result of experience. They don’t come from reading a trading book. They don’t come from watching a trading video. They come as a result of getting in the market and trading; making mistakes, identifying them, learning from them, and improving. Learning to operate in the uncertain market environment, is a process (or journey) of gradual improvement. Success in trading does not come from a Holy Grail strategy that you simply implement with discipline. You can't just GET a trading system or strategy; you have to BECOME a trader. It's a journey of trial and error; of two steps forward and one step back; of growth and development. It’s the infinite variations on the patterns within an environment of uncertainty, being executed and managed by a trader handicapped by fear based decision making, that make this game so hard. I can’t give you a solution – it’s a journey that you have to take; a process of growth and development. All I can do is point you in the right direction. Learn to read the price action. Determine the market environment. Learn to place current price action into the context of higher timeframe market structure. Identify areas of opportunity within that environment. Find a low risk entry position. Get in. Manage the hell out of the trade, in order to firstly minimise risk and secondly maximise opportunity. Make a ton of mistakes. Review them. Learn from them. Repeat them over and over until it finally sinks in. Grow and improve. It's not about simple, objective entry and exit rules. It’s about knowing when to take the setup and when to avoid it (based on context and the current nature of price action). It's about knowing when to use a pullback (limit order) entry or when to take a breakout entry. It's about knowing when to scratch a trade, rather than hold on hoping for it to reach the target. It's about learning to be ok with being wrong. It’s about learning to TRUST yourself. It’s about learning to TRUST the strategy. It’s about forgiving yourself when you make mistakes. Again and again and again! It’s about being ok with losses, and with stopping out to the tick before the market moves on without you, because you’ve seen this enough times to know that it’s just part of the game, and you can simply move on to the next setup secure in the knowledge that new equity highs are just around the corner. This all takes time – exposure to the markets – exposure to the process of making decisions and taking action – exposure to error – exposure to loss. It’s not about certainty. It’s about becoming comfortable operating in an environment of uncertainty. Knowing that you don’t know what’s going to happen next, and being ok with that. Knowing that even though you don’t know where price will go next, you have proven through experience that you have the skills, knowledge and attitude required to manage the opportunity appropriately to minimise risk or maximise gain, regardless of which eventuates. Learning to trade is NOT learning a price action setup. It is a process of BECOMING a trader. It is a journey of growth and development – developing your perceptual abilities; developing your awareness of risk; developing your decision making abilities; developing your tolerance for uncertainty. Learning to trade is a process of Trader Development.